Airbrush T-shirts are super fun for everyone at parties, events, festivals and more!! 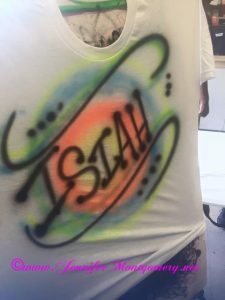 We airbrush shirts for parties and events of all kinds in Philadelphia PA, Miami FL and Key West! This entry was posted in Airbrush and tagged airbrush tshirts, face paintng for kids parties, Florida Keys Airbrush, Florida Keys Kids PArties, Key West Airbrush, Key West Parties, Kids Parties Miami, Miami Airbrush, Miami Parties, Philadelphia Airbrush. Bookmark the permalink.